A friend in France, who got it from a friend in Mexico, who got it from a friend in Argentina, sent me this. 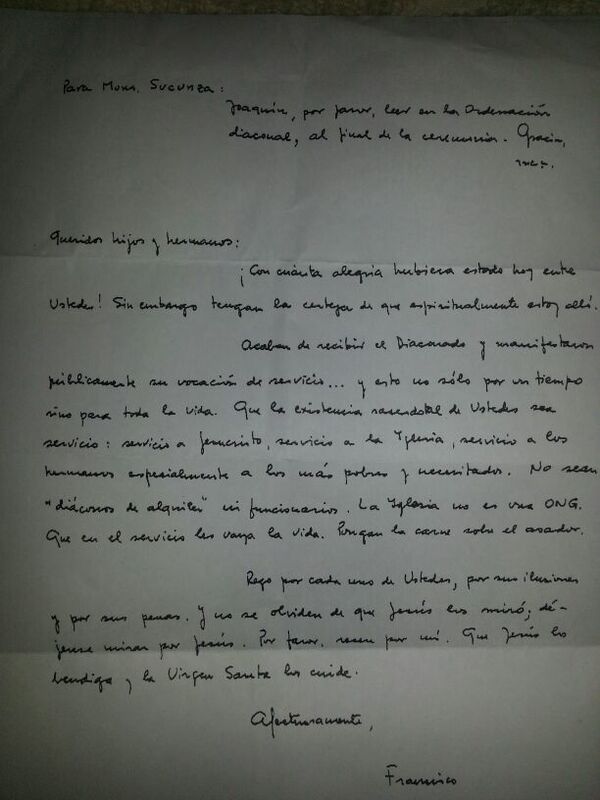 It’s a letter that Pope Francis wrote to the seminarians of his diocese who were ordained deacons (in preparation for the priesthood) a few days ago. I did my best at translating. Joaquín, please read this during the Deaconate Ordination after the ceremony. You don’t know how much I wanted to be among you today! Nevertheless know for sure that I am with you spiritually. I pray for each one of you, for your dreams and sorrows. And don’t forget that Jesus looked at you; let yourselves be looked at by Jesus. Please, pray for me. May Jesus bless you, and the Blessed Virgin take care of you. Francis is giving great advice for future priests, and I am so grateful for it. And to think that in the hustle and bustle of his first few days as Pope he cared enough to hand-write a letter to these deacons! I think that his advice is so powerful because he lived it first. “May your priestly existence be service.” Amen! It’s been one wonderful week with our new Pope, and hopefully this is just the beginning. PS – I’ll be on EWTN radio tomorrow at 7:15am Eastern Time on the “Son Rise Morning Show” with Annie Mitchell to talk a little bit about Pope Francis and a lot about the Church-a-thon (www.churchathon.org). If you’d like to listen, tune in to your local EWTN Radio affiliate or go to www.sacredheartradio.com !